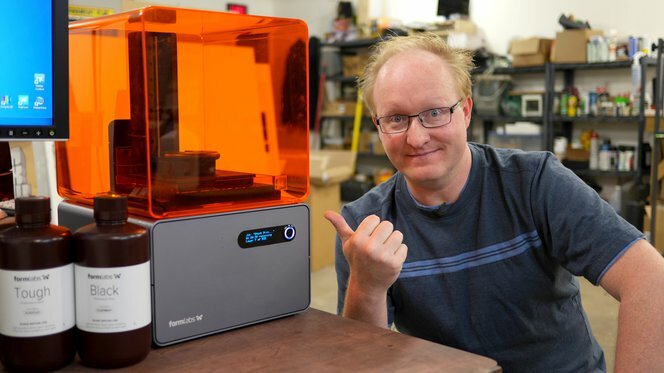 Ben Heckendorn, master hacker and star of element14’s <a href="https://www.element14.com/community/community/experts/benheck" "rel="nofollow" target=“_blank>The Ben Heck Show has been having fun with the recent addition of a Form 1+ 3D printer to his workshop, creating an oscilloscope watch which you can see in their latest episode. The weekly show educates viewers on how to create their own DIY projects, including portable Dreamcasts and Roombas that can collect Nerf darts. As a passionate tech hobbyist, 3D printing has given Ben additional customization when building his elaborate projects. For his most recent episode, Ben set out to create a watch capable of detecting the electronic frequency of signal voltages. To create the casing of the watch, Ben used the Form 1+ to create a smooth surface finish, as well as hold the detail needed to mount the electronics. Ben’s had experience with a number of 3D printers, and chooses the Form 1+ when he needs precise, high-detail results. In a previous episode, Ben built a calculator from scratch. This was no ordinary calculator; when you turn it sideways, the button mappings changed to become a qwerty keyboard such that every key has multiple functions. Ben printed the black buttons on the Form 1+ to display the intricate text needed to denote their multiple uses. Be sure to check out the latest installment of element14’s The Ben Heck Show and see his project first hand!